Contemporary Medical Acupuncture is a precise peripheral nerve stimulation technique, in which acupuncture needles are inserted into anatomically defined neurofunctional sites, and stimulated with electricity for the therapeutic purpose of modulating abnormal activity of the nervous system. This differs from Traditional Chinese Acupuncture where acupuncture points follow meridians on the body. Contemporary Medical Acupuncture is mechanism-based, not disease-based. Therapeutic goals and treatment targets are selected based on the identified neurological dysfunctions contributing to the clinical presentation of the symptoms. “Neurofunctional Acupuncture” is a physiological intervention similar to exercise that elicits the up-regulation and down-regulation of specific cellular processes. Another helpful tool with injury recovery and performance is dry needling. 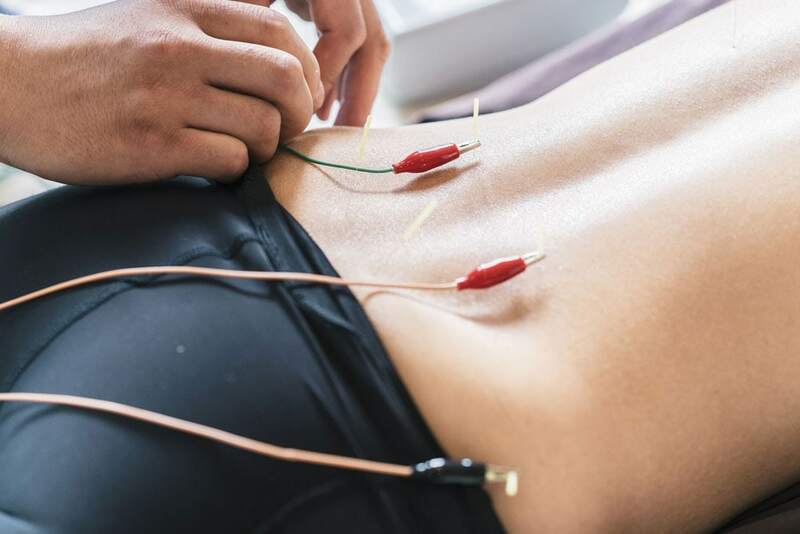 Dry Needling is an effective therapy to treat muscular tension and spasm which commonly accompanies conditions such as arthritis, nerve irritation, muscular strain, ligament strains and herniated discs. Treatment utilizes acupuncture needles to specifically target injured muscles that have contracted and become shortened from distress. Dry Needling is also known as Trigger Point Dry Needling or IMS (Intramuscular Stimulation). When an injury occurs from repetitive use or acute trauma, inflammation will be produced from the damaged tissues. The damaged tissues will also go into a protective tension state or contracture to guard against further damage from utilizing the injured tissue. This contracture and inflammation inhibit microcirculation which limits both the oxygen rich blood reaching the injury and the waste products leaving the injury. The injury site becomes hypoxic (decreased in oxygen) which stimulates the body to produce fibroblasts, a cell that produces fibrosis or scar tissue. This fibrosis and scarring builds up around the muscles and tissues limiting the tissues ability to fully function (lengthen/shorten) and can also cause compression and irritation of nerves. Dry Needling uses a small, solid filament needle which is inserted in a contracted painful knotted muscle to create a local twitch reflex which is both diagnostic and therapeutic as it is the first step in breaking the pain cycle as research shows will decrease muscle contraction, reduce chemical irritation, improve flexibility and decrease pain. When a needle is inserted into muscle it will also produce a controlled lesion and will cut between three to fifteen thousand individual muscle fibers. The body considers the needle as a foreign invader and will activate the immune system as a response. The cut muscle fibers also produce an inflammatory reaction that your body will respond to not just locally but all over the body to reduce inflammation systemically. Regardless of the injury, these tools can be used to speed up the recovery process. To put things simply, Contemporary Medical Acupuncture is like hacking into the body’s nervous system to change the way it functions. The nervous system is the body’s software. Without proper functioning software, the hardware (muscles, joints, etc) cannot work normally. This acts as a system reset.